Frost fairs seem to be popping up in quite a few books I read, including here and here. The last time the Thames froze over and there was a frost fair was during the winter of 1813-14, which is when this book takes place. I thought this was interesting, and the cover copy promised a nerd hero, so I was intrigued. 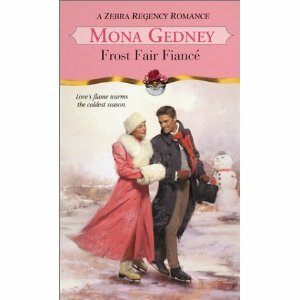 The term "frost fair fiance" was taken from a woman who needed a man to pose as her fiance. After the ice melted and the frost fair was dismantled, so too was their engagement. Likewise the heroine of this story, through a series of misunderstandings, must also take a frost fair fiance to deter an unwanted suitor. I found the pacing of this book to be a bit off. The hero and the heroine don't meet until a good 75 pages into the book (keep in mind the book is only 220 pages long), and a lot of the whole story is taken up with details of the heroine's huge family of cousins and their children. I liked the hero, who is indeed nerdy and sarcastic and grumpy. I also liked the middle part, where everyone is snowed in and then attends the frost fair, as I felt it was a glimpse into an interesting historical event. However, the ending came much too abruptly for my liking. I felt as though we hardly got any relationship development, and I couldn't see how the heroine was anything special that she would capture the hero's heart. In fact, I found her kind of boring and I had a hard time figuring out why the hero would go from being so antisocial to wanting to get married. The whole frost fair fake fiance business doesn't even come until the very end, even though the blurb suggests this is the main plot. I wish this book had focused more on the romance side of things and less on crazy family shenanigans.